Tip: If you do not have time to create lists of your own, consider following lists other users have created. Check out the lists created by some of your favorite tweeters and quickly get access to a whole new feed of content and potential leads. Canva: Our favorite design tool by far. Within minutes you can create and post completely customized designs. The best part? Canva has pre-sized social media templates to make sure your designs look perfect on Twitter or wherever you post them. If you are sharing content created or first shared by someone else, give them credit by including their @name in your tweet (as shown above). Start doing this and you will be surprised how many of the people you credit will follow you and/or share your post with their audience. The tweet above was retweeted by Ann Handley, a social media expert with a Twitter following of more than 300,000, which led to significantly more engagement and reach. When someone includes @eclincher in their tweet we get notified that someone mentioned us and can easily respond back, retweet, etc. Most businesses do a great job of monitoring this type of mention, as Twitter makes it very easy. However, what happens when someone mentions “eClincher” without the “@” symbol? That is where it get tricky. Twitter does not send a notification unless they include “@” which leads to many businesses missing a good percentage of total mentions. Luckily you can track mentions of your company’s name by typing it into the search section of Twitter or with eClincher’s custom feeds. Tip: Create custom feeds in your eClincher account to make monitoring important keywords related to your brand easy and productive. These feeds will be saved, so you can easily check them for new mentions anytime. Your Twitter profile might be your first impression with potential customers, so make sure you take it seriously. The header picture is a great place to show off your product/service, as well as to promote events, your other social accounts, promotions and/or hashtags. As time goes by, make sure you continue to tweak your bio and update your pictures to positively reflect your business. Social media is full of valuable information, as long as you know where to look and what you are looking for. Smart businesses are now monitoring social media to help improve their product/service, stay ahead of new trends and keep an eye on competitors. Create a list of 5 to 10 keywords you want to monitor and keep an eye on them daily. Answer questions, join conversations and learn from what you see. Your goal with every tweet you send should be to add value to your followers’ timelines. When people follow you it is a sign they are interested in the value you can bring them and you should do your best to deliver. The best way to do this is to pay attention (listen) to the problems they are having, the questions they are asking and topics they are discussing. Even though you ultimately hope to turn followers into customers, you must resist from posting too much self-serving content. Instead become a go to resource for help, knowledge and conversation. Accomplish this and we promise more sales will follow. One of the downsides to Twitter is how fast paced it is. With the average lifespan of a tweet being less than an hour, it can be difficult to get your posts seen. To try to combat this issue, Twitter released the ability to ‘Pin A Tweet’ to your profile. When you pin a tweet, it will be shown as the first tweet when people come to your profile. When you post something important, such as a new blog post, you might want to experiment with pinning it to your profile. If you produced an explainer video for your business, you should consider pinning it so people can easily access it and learn about your product/service. If you are not already pinning tweets to your profile page, start experimenting with it now. When you retweet a post on Twitter, you now have the option to add a comment. We highly recommend all businesses take advantage of this feature. Adding context to your retweets will help to draw attention from your followers and can position your business as an expert. On top of that, it opens up an avenue for a conversation with the originator of the tweet. Take the extra 30 seconds to add a thoughtful comment to a tweet to either give more context for your audience or strike up a conversation about the topic covered in the post. This could be a 2,000+ word rant, but let’s keep it short. If you use a tool to send an automated direct message every time someone follows you, stop doing it immediately. It will get you unfollowed by the majority of people it is sent to, including us, and will be a bad first impression for those who do not decide to unfollow you. The benefits of automated direct messages are far outweighed by the negatives, so simply don’t use them. If you want to send a Direct Message to new followers, do it manually and make it personal. This small, but fatal mistake can greatly decrease the reach of your posts. When you start a tweet with ‘@’ it is seen only by the person tagged in the tweet and people that follow both you and that person. When replying to someone directly this is fine. However, many businesses mistakenly start tweets with ‘@’ not realizing it will be treated as a reply. If you have to start a tweet with someone’s Twitter handle, include a period before it. By including a period first, Twitter will treat it as a normal tweet, not a reply, and thus all of your followers will see it. One strategy businesses have used to try to increase their Twitter followers is following a bunch of accounts in hopes that they will follow back and then unfollowing them once they do. This strategy certainly could lead to more followers, but it defeats the purpose of social media. As a business your main goal should not be more followers, as this does not make you any money directly. Instead you want to create a community of people that you have built trust with over time. This trust will lead to sales, not the initial follow. Instead, follow only people that you think will bring value to your newsfeed and that you hope to be connected with long term. A short term boost in followers might seem exciting, but in the end only valuable relationships will lead to business success. We all know that person who tweets 10 tweets back to back to back. When we see this it drives us crazy, because it is doing far more harm than good. For starters, spreading your posts throughout the day allows your business to reach different time zones and demographics. When you post everything at once, you are missing the majority of your followers, since they are not on Twitter 24/7. On top of that, your posts cannibalize each other’s potential engagement. Instead of receiving Retweets and Favorites throughout the day, you are forcing followers to choose which posts they like back. It is highly unlikely that someone will engage with several of your posts at once, which is why you should find an ideal posting frequency for your business and stick to it. 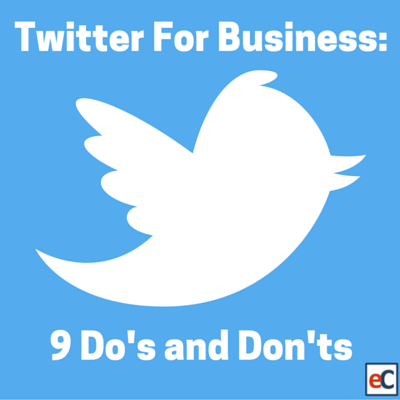 So, how can your business avoid this Twitter faux pas? Start using a tool like eClincher to schedule your tweets ahead of time. With the ability to view your scheduled posts in a calendar, you will be able to avoid posting too often and won’t have to spend additional time on Twitter. Bottom line: There are really no business benefits to having a private Twitter account, so make sure your business’s Twitter account it public. As a business it is easy to post too many promotional posts. We forget that most people in the world have less passion about our businesses than we do. Wanting to share our amazing companies with the world we begin posting tweet after tweet promoting events, discounts, new features, etc. There is certainly a time and place for these types of posts on social media, but is important to not bombard followers with promotional content all day. Tip: Many experts swear by the 5-3-2 rule that is shown below. It is a great starting point for most businesses, but be sure to experiment with what frequency works best for your business and audience. Dive into your Twitter post analytics and you will find something very alarming: many posts have more retweets than link clicks. This means people are sharing your posts without actually reading them first. As a business it is very important that you know exactly what you are sharing with your followers, so we recommend taking the extra time to not only read what is being said, but also who is saying it. We have actually seen several businesses tweet posts that are directing traffic to a a competitors website. Needless to say, they did not click the link before hitting Retweet. Imagine going to a networking event with a few friends. You show up together and for the entire event you only speak to one another. I think we can both agree this is a terrible strategy and it will lead to no new connections. Go on Twitter however and it is very common for people to only engage with their followers. We completely encourage you to continue to do this, but challenge you to engage with people you are not connected with as well. Monitor relevant hashtags and keywords looking for opportunities to engage with new people. Join conversations, share their content and make new connection. #Please #do #not #tweet #like #this. Hashtags were created to make it easier to find content and conversations about specific topics. When used effectively hashtags can significantly increase your reach and engagement, while also helping you find new leads. Adding a hashtag to every word in your tweet however will result in many users unfollowing you and very little boost in engagement and reach. Try to incorporate 1-3 hashtags in your tweets. Only include a hashtag if it is relevant to both the content you are sharing and your target audience as a whole and avoid using trending hashtags just because they are popular. We really hope this list helps your take full advantage of Twitter, while avoiding any costly mistakes. If you have any Twitter do’s or don’ts that weren’t included on this list, add them in the comment section below! If this helped you, please share it so it can help someone else.